Advising those decisively influencing the world around us. How would you introduce yourself? Who are you? Who am I? This is a question I have spent much time thinking about and looking for the answer. In short: I am the captain – the ‘crisis captain’ – who pilots the ship into the harbour during a storm or guides it safely from the harbour to the sea, and then hands it over. The ship, of course, is a metaphor for a company, a multinational business, a government body, a municipal administration or any other organisation. I have come to realise that my advantage is both in knowing how to finish things and also initiate them from scratch. Who do you advise? Who do you work with? I work with people at the top, with those who carry the most influence. When I was 24-25 years old, I said to myself, one day I will be working with state presidents and my company will change the system. I have been following this vision ever since. There have been some larger or smaller deviations along the way but I always come back to this set course. How do you feel with such high-flying goals? You say you want to change the system – do you ever fear this? No, I feel complete. I know this is my path. What exactly is your job? Is this consulting or would you use some other expression? If I may answer somewhat indirectly, maybe I should start with the meeting I had this morning at one of the western European national banks. The governors of the bank, who are facing a certain obstacle due to an undefined hierarchy, called me. Since the beginning of the year they are unsure of who exactly is in charge – the governor can influence decisions with a ‘golden vote’ but otherwise their positions are equal. The vice governors are each responsible for their respective fields. They realised that they needed someone to make the whole situation clear, someone to establish authority. The situation is not so simple because each them—all five—hold authority over the field they cover. When they called me for help, it was because they did not know who to ask for guidance. They weren’t sure if they needed a lawyer, an economist, a psychotherapist or someone else to help them. I have established a name for myself in the past 18 years, precisely because of such cases. People call me when they do not know where to begin. And how are you going to handle this particular case? First I will carry out a long interview with the person who called me and asses if the person is diagnosing the problem correctly. When I had a conversation today with the managing director and director of human resources, I saw where the problem was. My task was to establish balance within the system. They called me on the recommendation of the vice governor who is responsible for relationships with other banks and whose role was always that of Executive Director but never Chairman of the Board. He himself had arrived as an equal member of a team and was now suddenly in charge of everything. He simply couldn’t see himself in his new role as leader. As a rule, it is those who have the most responsibility at a company who call me, those at the top of the hierarchy – in this case there were five of them. I work with the presidents of boards, directors, managers, even presidents, mayors and other politicians – and then with their subordinates only in the later phases of the transformation process. Are your clients only large organisations? Or are you also called upon by smaller companies? There is a family-run company where the fourth generation is now gradually being included in the work process. I have been advising them for the past eleven years, mostly with regard to the relationships within the company. The reason they called me originally was that they were not able to navigate the generational handover from the parents to their grown children and grandchildren. The father, the owner of the company, had called me to prepare the son to take over the business. I worked with them for a year and a half towards this goal. In the end, the parents were satisfied and it appeared that they no longer had issues with handing over the business. I managed to help the son – who suffered severe stress due to this whole situation – to stand on his own two feet again. Eventually we worked through the issues and the children felt like they had assumed responsibility for something that had been a defining family tradition, but actually they were still not responsible for anything. The father, in fact, didn’t really want to hand over the company, even though that was his own directive. A year later the son called me and told me that he was having problems with his father and asked if I could visit them again. The son had ‘grown up’ in the meantime. But even though it had been agreed that the children would take over the business when their father turned 60, when the time came he did not want to step down. When the son brought this up in a meeting, the father again assured him he would step down this time, but again didn’t really mean it. As I started to work with the son once more, his position in the company grew stronger and stronger, but this fact actually made his father unhappy, so the latter called me in for a meeting – after which he relieved me of my services. After that I began meeting with the son outside the company while the parents tried to influence me through third parties. I suggested to the son that we temporarily cease our sessions since they were negatively affecting him. I advised him to make a decision: he should either stay in the company, sue his father (even though the son was appointed director, the father still held ownership of the company) or leave and start on his own company. The son and I are still currently working together, he is waiting for his father to come around and has accepted his role as dictated by his father. The situation works as long as the father agrees with everything. Would you help anyone who wanted that? I work with people at the top or want to get there – with those who have potential and a sense of purpose. Who can afford this type of consulting? Even small companies? Does this make sense for them and does it pay off? Of course! It depends on the goals set by the director, regardless of whether the company has five employees or a hundred. The price is the same for all my clients since I invest the same energy into advising the director of a small private company with three employees as I do with the CEO of an organisation with a thousand employees. The client whose firm has only three employees is sometimes even more complicated to advise and often demands more energy, actually. It’s true that the structure of a large company is much more complex but generally the director has things under greater control. There aren’t so many unresolved matters since the basic issues are generally much clearer to him or her. Initial consulting costs start roughly around 10,000 Euros. My support is 24/7 so it is sometimes very difficult to set the price. We do not agree on a certain number of hours, after which a written report is made and I simply walk away. This is also why my clients and I frequently prefer to negotiate compensation, or I advise them in return for a share in the company. This of course means that the client and I continue to develop and grow together. When do companies realise that they need a consultant, a coach or a ‘crisis captain’? There is a construction company where leadership of it was taken over by the widow of the director, who had unexpectedly passed away. Until then she had been in charge of the company’s finances. In her own opinion she was doing a good job, since they still had enough work. However, she didn’t realise the crucial role her employees had played in this stability: they had been voluntarily working 24 hours a day, often seven days a week. When, after a year, they couldn’t handle such an enormous workload any more, the employees began complaining. She called me in to help her restore order in the company because, in her opinion, the employees had become completely irresponsible. Usually, directors call me on the recommendation of somebody, but this widow had read an article about me in a business magazine. When I got to know the situation, I had to tell her that it was not the employees who were being irresponsible, but it was actually she who was responsible for the situation. I was very careful and diplomatic about it, but I knew I had to be honest and direct to a certain point to provoke a certain degree of shock. A soft, positive shock, that is. I explained to her that I completely understood her, but it was clearly written in the employees’ contracts what their jobs were, how long they were expected to work, which goals must be reached and what they were entitled to earn for that work. If they worked more – and they had been working much more – an agreement had to be made concerning compensation for their overtime, either they should be getting a share in the company or something else. She hadn’t given them anything above their usual salaries. I asked her what she thought and where we should start with the changes – with the employees or with her? At first she became angry, saying, ‘Who do you think you are?’ And I always let people tell me everything that is making them angry, of course, everything that is bothering them. After that, most of them are finally ready to take a step back and consultations can begin. First the director’s positive self-image must be restored, mostly by starting to communicate with the employees. Afterwards we can establish together how things can be done differently. Now we are probably talking about your dynamic communication model? Yes, that’s right. The dynamic model consists of one or two processes of transformation. 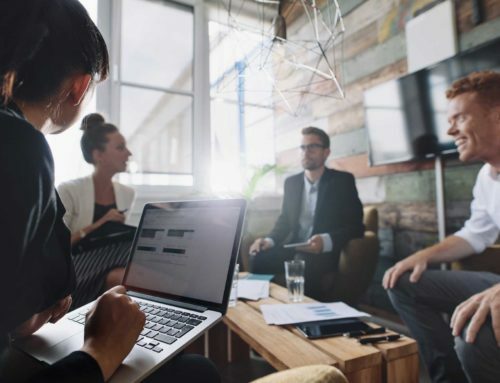 We can go ahead either with the Sirius Personal Transformation, which consists of advising the director or chief executive to guide them in their transformation, or the process can continue – if necessary – with the Sirius Business Transformation. This depends on whether or not the company itself also needs changes. Does the process sometimes end with just the director taking personal advice? 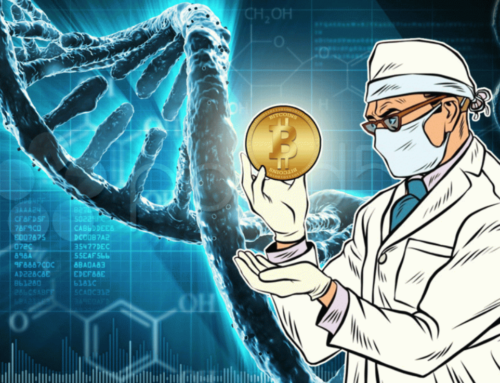 Could this already be a solution for the company? Yes, when the system is healthy and it is only the director who must take some steps in a new direction – with the help of someone who is themselves not involved in the process – in order to look at the situation with a broader perspective. This is in situations where the director is a person who acts from the heart and in accordance with his personal nature and not on the basis of his frustrations and ego. When people spend years and years within a certain system they become like racehorses with blinders on, uncritically fulfilling their roles. I try to broaden their horizons and help them see things. I am not a magician, I do not perform miracles, I just show them what they have overlooked. As a consultant you don’t have the right to do anything but show the client in which direction they can go. You also mustn’t do anything instead of them or for them. You just put up a mirror, and sometimes you see that the optimal solution is for the director or chief executive to retire. When I ask my clients if their colleagues from the office next door remind them of their first grade schoolmates, they all admit – to their own surprise even – that they indeed do. ‘What about those four, maybe a sports team?’, I continue. All of a sudden, the client realises that their entire childhood has been mapped onto the company. ‘Isn’t it obvious that you have transferred unresolved childhood issues into the company and that there is a good chance that this too shall end just like your childhood – that is, too quickly?’ Then I often discover that their childhood ended unexpectedly with some kind of shock or traumatic experience, that they had to find employment and look after themselves. Then I ask about employee satisfaction and get the predictable answer that they are unhappy, and that absences and sick leaves are frequent. I slowly show the client the images populating their subconscious. This frequently ends in tears when they realise how many years they have already wasted because of unresolved issues from the past. Many of them then ask angrily, ‘So, in your opinion, I am to blame for the current situation in the company?’ When I answer ‘yes’, some clients just say, ‘There’s the door, I didn’t hire you to tell me everything is my fault’. Some cases finish just like that. Your work is giving advice. Who in your life gave you the best advice or taught you the most? Formally acquired knowledge is not enough to be a successful consultant. Many skills must be learned through more informal educational methods that are not always so obvious. It is only through a combination of formally acquired knowledge and informally acquired skills that a holistic approach can be used in the search for answers. I was also greatly influenced by two athletics coaches Miroslav Prstec (Miki) and Žarko Markovič (Žare). Miki was a musician and no matter how tired he was after performances he always carried out athletics practices easily and calmly. Through him I realised that things can be done in a completely different way than I saw at home – without nervousness, panic and with a kind of natural calmness. Žare taught me order and persistence. Just like him, I was not a particularly talented person, so I had to work especially hard for each achievement on the athletic field. He taught me that I have to set a goal and with hard work, progressing step by step, I will be able to achieve it. These three people shaped me decisively between the ages of 14 and 21. What did you gain from your university studies? Already after I had finished my first year at the Faculty of Education in Maribor I started teaching physics at a primary school – they needed someone to teach physics two hours a week. So during my university studies I supported myself by teaching and that experience helped me realise that it was not the right profession for me. Despite having come to that conclusion, I tried again after I had completed my studies, this time at a secondary school, to see if I felt any differently. It was around this time that they began implementing a system of promotion and career advancement (and accompanying salary raises) based on points that one should collect by attending supplemental educational programmes and seminars. One of the seminars I attended was about so-called ‘quality’ learning, where you learned to be a role model for your students. A lecture called ‘The Path to Quality Schooling’ inspired me so much that I finished the three-year course in one year, and when I asked them ‘what’s next? Where can I continue studying this?’, they suggested reality therapy. I decided to take a two-year programme and finished it in 2001. This was my first encounter with psychotherapy. The participants of the programme were taught to use the acquired knowledge on ourselves, and as we were also learning how to help others at the same time, we were given the title ‘reality therapy counsellors’. My class mates were teachers, social workers – mostly people who wanted to learn how to avoid bringing their work problems home. Since I was at that time already working with companies – I was doing some programming for them, as well as educating them and optimising their workflows – I knew that business people have the same problems and that I can offer them solutions based on the knowledge I had gained. I very quickly realised, however, that matters were not quite as simple as we were told at lectures. Reality therapy teaches that the only important thing is what is happening right now. ‘What about the past and the future?’, I asked myself, since I knew that reality is not actually like that. This is what I started to research on my own. Meanwhile, I was already writing for various magazines as a consultant and when I mentioned the past and how it influences us in an article in the magazine Podjetnik (TN: a magazine specialising in business), I received a warning from the [Slovenian] Reality Therapy Association that I am not practicing in accordance with their theory and they expelled me. When I was trying to figure out what exactly I did wrong I came across ‘transactional analysis’. 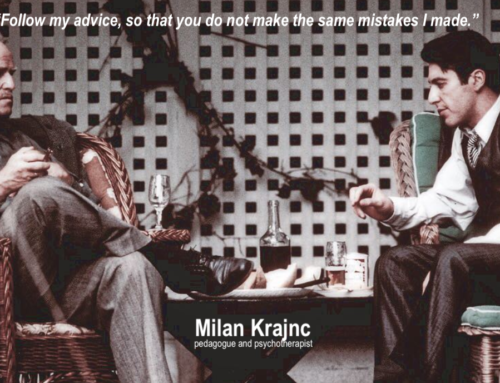 That’s why in 2007 I decided to enrol myself into a very intensive four-year course for transactional analysis with Martin Bertok; the studies were followed by three years of practice. I finished my studies in 2012 in Zagreb with Nada Žanko. In the meantime I taught myself various approaches to human psychology and informally studied neurolinguistic programming (NLP). In 2001 I was the director of Smiljan Mori’s company where everything is based on NLP. So now you are using all three theories – and you have also developed them further? Yes, because I’ve learned there is good in each of the theories I now use a combination of all three. Reality therapy, so that the client becomes acutely aware that everything he or she is doing is his or her own responsibility. Transactional analysis takes us to the past, so that we can see where all this comes from. Then we use NLP techniques to establish a goal, so that we can move things forward, away from the past. After that we use reality therapy again to raise awareness of each individual step. And during the process, while things are happening, we use transactional analysis again to clear things up along the way. Transactional analysis is not only used to analyse the past, it also helps us realise what condition we are currently in, why we react in a certain way when something happens to us and where it all comes from. You have added physical activities to psychotherapy, followed by some other techniques? You claim that a balance must be established before any changes can be made? Because I have seen that with one or even with all three learned analyses we cannot complete the whole story. 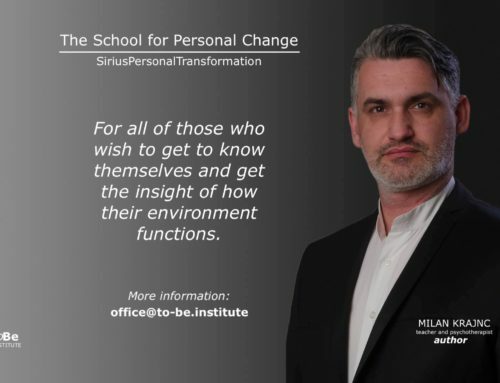 Through my experience gained with clients, I developed a seven-step programme that I call the Sirius Personal Transformation. At the same time, I was aware of an important point for the start: changes are possible only when we are in balance. What does it mean to be in balance? We must take care of our bodies, make sure to stay physically active and to follow a healthy diet. The healthiest food, in my opinion, is that which is grown locally, there where we were born. As far as physical activity goes, it is not enough to take the stairs to the fifth floor, we must get our pulse over 120 for more than 20 minutes a day. So, first we need to take care of our bodies. Then we must take care of our minds, our intellect – it is important that in your free time you focus on doing something that is completely different from what you do for a living (study art history, for example, if your work is in economics), so that a certain balance comes into being. Next, we must care for our emotions, which to me means to ‘have fun’. Fourth, we need to reach a state of being at peace with oneself (for some people this could be through prayer and meditation, for others it could just mean a beer with friends after work). Only when you set up this kind of balance in your life, can you start thinking about what needs to be changed. When you have balance, you can start organising your day. First you have a meeting with yourself in the morning and only after that with your colleagues, and when the day is over you look at what you have accomplished and what your plans are for the next day. Once you have your day planned, you can plan the whole week, a month, a year. These were the beginnings of the dynamic model. Once you are calm and able to see where you are at the moment, then you must go through the seven phases I have defined in this book. So, these four things must be taken care of first? Before the transformation? Yes, managers who look for solutions by practicing extreme sports are only hurting themselves. We must go through these seven phases and when we complete them, we realise we’ve made a ‘quantum leap’ because there is no going back afterwards. Many things happen during the process, of course, people experience emotional breakthroughs and so on. We’ve also started implementing medical check-ups before Phase 1 commences. Each person must establish some kind of balance on his or her own. No psychological training will help us if we have physiological limitations. Therefore, we first do a psychological and physiological evaluation, then balance is established in the next phase – and only then can the process of transformation begin. This is realistic, doing it any other way would only be doing something halfway. Do you live by your principles – that is, do you practice what you teach? Everything, except for my diet – that’s something I have not managed to fix yet because I haven’t taken enough time for it. Otherwise, because I made so many mistakes in my life as a result of not wanting to admit certain things to myself, my ‘cleansing’ took several years. When I started developing the method, I didn’t go to a book store and buy a manual, I was searching for a way out of my own troubles. The method was developed as a consequence of trying to help myself. I did not have a happy childhood and later on things did not go completely smoothly. When I was younger everyone talked about some kind of inner peace even though we didn’t know what that was exactly. Under the phrase ‘inner peace’ I imagined myself being a millionaire by age 35, able to retire and under no obligation to do anything anymore – an image from American movies, of course. Then I realised that it is possible for one to find happiness in what one does. Being a teacher was unfulfilling, even though at first glance I had everything (a regular salary, two months of holidays, I finished work by noon). When you head out on your own you imagine it will be better, that you will be able to afford more things you want. But as a consultant I didn’t get paid regularly, I had less time for my wife, which didn’t make her happy and consequently I wasn’t happy either – and that is why I was searching for a solution. I was searching for it in the same way they started teaching us physics at university: as if we didn’t have the slightest clue about anything. We were studying empirically, that is on the basis of experience and cognition, the same way they did it half a century ago. And I, too, came to my own model on the basis of a theory, or theories, but most of all on the basis of things I’ve experienced. Everything that was going on in my life helped me develop this method, it is simply a consequence of what has happened to me. And now, on the basis of this, I can teach others to do things differently, as well. The theory itself developed when, in one of the articles in the magazine Otrok in Družina (TN: Child and Family), I was explaining the relationship between husband and wife and used the metaphor of a stream. ‘While the stream is running, it is clear and drinkable. If we block the flow of the stream, the water becomes stagnant and starts to smell and taste bad.’ The same goes for communication between spouses if they don’t talk enough to each other, each one starts to develop a story in his or her head and they end up arguing without even knowing why – and then they start to drift apart. Adequate and correct communication keeps the relationship healthy. And then I transferred this kind of relationship or way of communication to a corporate environment, since the employees there are also in a relationship, so to speak. I named this way of communication a dynamic model of communication and gradually a dynamic model of leadership developed. Who can enrol into your educational programmes? What do the participants learn? I founded the toBe Institute where everything I teach can be studied . 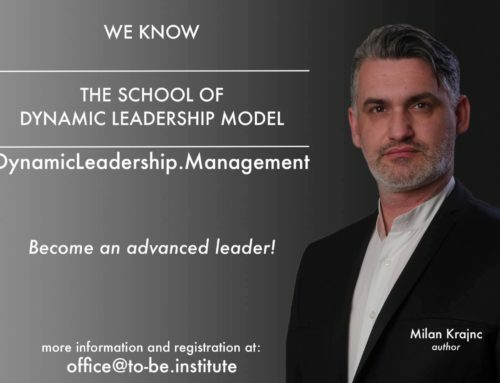 The purpose of the toBe Institute is to further develop the Dynamic Leadership Model on a scientific basis, as well as to educate and develop people who wish to study DLM, workflows within a company and themselves in depth. Studies at the toBe Institute are intended for those who have already reached some kind of peak in their careers and now also want to discover and explore themselves. The emphasis is on individual and consulting work (the first year is mostly spent helping candidates get to know themselves). In the second year students acquire knowledge about various alternative methods and learn some forgotten skills, they also get insight into how they influence their environment. Studies in the third year are for those who plan to teach, and the fourth year is for the most ambitious students who want to establish their own school with toBe Institute certification. I am sure it is possible to connect with everyone on some level, to tune into the same frequency, as it were, even though as a physicist I can’t explain how. I already use this knowledge every day – I teach managers to use telepathy and how to read minds, I supply energy for procedures to run faster – these are the things I want to develop and research further at the toBe Institute, skills we used to have but have been forgotten in the western world due to the fast pace of life. When you put yourself in balance, reach a state of calmness and liberate yourself from all the garbage in your head, you begin to sense certain things. It doesn’t mean you become schizophrenic and see some other world, but you in fact become more aware of things that you would have missed in the past. A lot of people and organisations are offering things these days, say, connected with energy or what have you. I’ve also studied many things – I am a Reiki master, Theta healing specialist and have studied numerous other alternative approaches. Our students learn many alternative methods from experts who practice them. Everything, however, is always explained on the basis of scientific methods. Milan Krajnc is an expert in solving the challenges that arise from the interaction of different personality types within a company or organisation of any size and scope, from local to national levels. He is able to complete projects that are already being undertaken as well as initiate transformation from the very beginning. He seeks out the root of a problem and eliminates it. He is the creator of the Dynamic Leadership Model. The Dynamic Leadership Model is a business leadership paradigm based on the laws of nature. Workshops and consulting are carried out around the world where the hotel is located. PIP-Z, druge zdravstvene storitve, d.o.o. 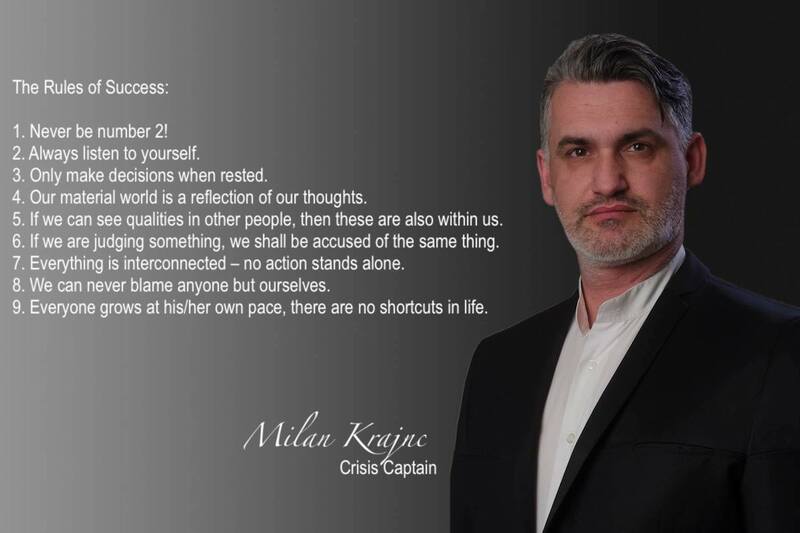 E-Book for success by Milan Krajnc is now finally available in your language! Get your e-book for only 29,90 EUR! Sign up HERE and get latest news from blog.